Ensure safety and effectiveness during agricultural spraying with the Kestrel 3500 Delta T.
To ensure safety and effectiveness when spraying, it is critical to measure relative humidity, wind speed and wind direction. Many locales regulate the maximum permitted wind speed during spraying to minimize spray drift. In hot, dry conditions, expensive chemicals may evaporate into the air rather than onto your crops. However, you can minimize costly evaporation by selecting an appropriate nozzle and increasing the spray droplet size. 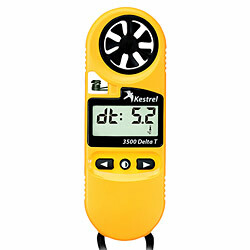 The Kestrel 3500 DT incorporates a Delta T calculation, the spread between the wet bulb temperature and the dry bulb temperature (in degrees C). Delta T offers a quick guide to determining acceptable spraying conditions. For example, it is not recommended to apply pesticides when Delta T is above 10 - a range of 2 to 8 is ideal. With the Kestrel 3500 Delta T, the calculation is done for you accurately and simply.